You will agree with me that we are now living in a world where rideable technology is now the order of the day. With each year passing, rideables seems to get more advanced and crazier thereby making a lot of them available for you to keep track of. With the increasingly overcrowded market, picking the best electric skateboard as a personate skateboarder might be challenging and a bit tricky. However, this review will help you navigate the market, so you can have the best bang for your money. No doubt, checking out this article will give you a higher chance of choosing the top pick. Read further as I take you on a trip. You don’t need to be rush when purchasing an electric skateboard. Do intensive and extensive research on all the options you plan to opt for and check out their features. Before you make your final decision on the best electric skateboard you will go for; it is advisable you make use of these factors to examine your choices. Materials Used For The Deck – The skateboard’s build quality is one of the first things you need to scrutinize. It will give you an idea of how the skateboard can endure and withstand potential damage. Most of the time, the best decks are forged from high-quality layered wood. Note that different skateboard has a different number of layers. They are often 5 to 10, and the rideable with more layers will be durable and flexible. Also, there are some brands that use materials such as fiberglass to reinforce the deck. They are also a good choice because it helps to boost the resilience of the board. Overall Quality Of The Wheel – The wheel is one of the extremely important accessories in the electric skateboard, so it is a vital factor to consider. Polyurethane is often used in the construction of the wheels. Hardness and size can affect the overall quality of the board’s wheel. Harder wheels skate faster, has improved grips when used on smooth roads but less grip when used on rough roads. On the other hand, smoother wheels have more grips when used on rough and tough surfaces or terrains. Ensure the overall quality of the wheel is fantastic regardless of the hardness, size, and material it is made of. Battery Juice – There are two types of battery used in electric skateboards they include lead-acid battery and rechargeable lithium-ion. The latter is often used in most of the boards. When picking an electric skateboard, it is advisable to assess the battery type, its lifespan, and battery life. Note that lifespan varies with the brands but on the average, it should be around one thousand cycles. Overall Wattage The Motor Can Supply – Checking the controller parameters, wattage, and gear ratios should also contribute to your final choice. Note that if an electric skateboard has a higher wattage does not mean it will provide more torque or move faster. All the features mentioned contributes to the speed of the board. I want you to know that higher wattage might have its disadvantage. It makes the motor operate louder. It means you should try and go for a reasonable number of watts. Something between too low and too high but not both. You can go for a dual motor if possible because it gives more power. Speed – There are many boards that allow you to regulate the maximum speed you can reach. They come with pro and beginner. It is advisable that you check the top speed that a particular product has to offer. If you want a really fast skateboard go for ones that can go as fast as 22-24 miles-per-hour. For you to gain full control over the speed while riding, you can go for skateboards with variable speed controls. Braking System – The braking system is a factor that cannot be neglected especially for safety purposes. Regenerative braking is often used in electric skateboards, but some use dynamic braking. However, others use both braking systems. Even though both are similar, the former is preferable because it has the capability to dissipate energy as heat by redirecting electricity to a resistor. When this happens, the battery will be recharged. 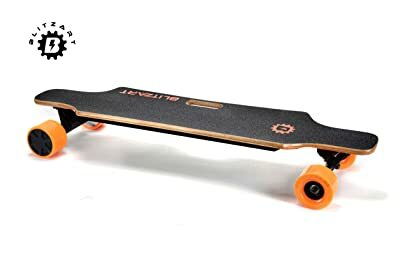 I suggest that you go for a skateboard with both braking systems because it gives you the opportunity to switch from regenerative to dynamic braking when the battery is fully charged and allows you to safely slow down. Riding Mode – The riding mode of the electric skateboard is determined by your level of expertise. If you are a newbie with little or no experience riding a skateboard, go for ones with beginner mode. But you can also go for one that allows you to switch between modes. Range – To make the final and best decision, I will advise you to consider both range and speed together. This factor depends on how you will use your skateboard- whether you want to use it frequently or for long-distance trips. If you are riding frequently, don’t go for a board with low range and mileage. Most of the upmarket electric skateboards often offer 7 to 8 mile of range, and they are okay in most cases. At least you can reach the restaurant or your office before you need to charge it again. The one with a bigger battery pack or fast charging often times provide a higher range. Let your requirements and activities determine the range you will go for. Weight Capacity – The weight capacity of electric skateboards varies. So it is an important factor to consider when buying the best electric skateboard. Go for a product that will accommodate or hold your weight as a rider. Note that the overall performance can be affected if the weight limit indicated on the board is lesser than your weight. Ability To Climb Hill – This factor should be considered by someone who wishes to use the skateboard to climb hills. Even though most of the electric skateboards can climb hills, there is variation in the built of each model. The best electric skateboard models that can zip up hills often range from 15 to 25 percent. I will advise you to compare the hill grades of the different choices you have selected. 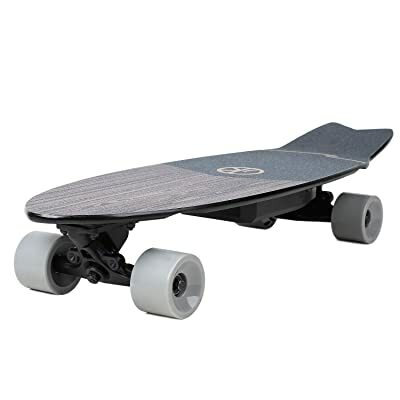 Some other factors you need to consider apart from the one mentioned above are grip tape, self-balancing capacity, and the digital or modern trends features like LED lights and wireless remote. The teamgee H5 Electric Skateboard comes with a 780-watt dual motor that offers the speed up to 22 miles-per-hour, range of 11 miles, and 25 percent grade hill climbing. With such power, range, speed, and grade hill it is powerful enough to give you a smooth ride when riding on any terrain and climbing hills. The product features a deck that is forged with 10 layers of maple and reinforced with one ply fiberglass. This feature provides a medium flex for you to have a smooth ride. Also, the product has a high-performance Lithium battery that can work for six to eight hours and ensures you cover a long distance and get to your destination before recharging. It charges for about two hours. Included is a wireless remote control with the LCD screen. It has a LED flashlight, two-speed settings, cruising mode, speed indicator and also displays the battery. The length of the skateboard is 37-inches, and it comes with a wheel made of Polyurethane having the hardness of 83. If you are looking for something that will not stress your budget and still offer you the performance you are looking for this might be the perfect option for you. It is one of the best electric skateboards you can refer to as small but mighty. The product has a certificated 4.4Ah lithium battery that you can charge fully within two hours. It comes with a range of 12 miles and a maximum speed of 13 miles-per-hour which ensures the users enjoys a top speed. The deck is made of 7 ply maple layers which ensure durability, strength, and a high level of stability when riding at top speed. It is capable of supporting a weight of about 200lbs. Also, the VOKUL V1 Electric Skateboard features high-rebound 70mm wheels that offer a great grip and roll and also promote a smooth and more secure riding experience. Additionally, it comes with a six-inch truck made of aluminum for safety and toughness. It has a 350watt hub motor. Despite this, it provides incredible speed and enough power to ride up the hills. The skateboard comes with a regenerative braking system that improves energy, braking efficiency and extends driving range. 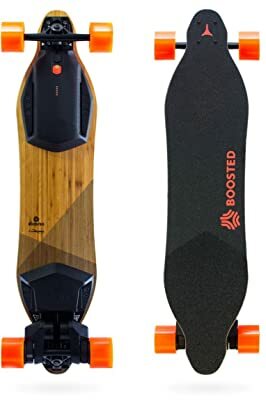 Boosted 2nd Gen Dual+ Standard Range Electric Skateboard is one of the high powered skateboards and best electric skateboard on the market. The 2000watts of power makes it one of the best electric skateboards you can go for. With the powerful motor, you can enjoy an unforgettable and whole new riding experience. The product comes with a dual drive system that is capable of giving a smooth braking system and acceleration. The deck is forged with 100% bamboo which makes it flexible and ensures you maneuver and handles it with ease. 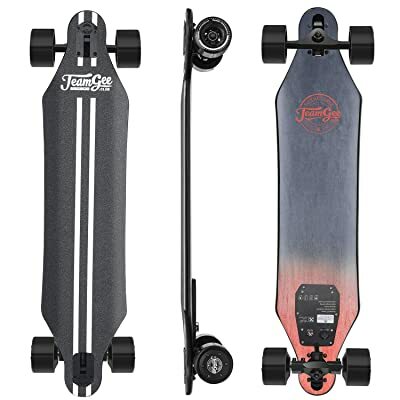 The skateboard features the range of 7 miles, top speed of 22mph, and hill climbing grade of 25 percent which give you more than enough time to run errands. Additionally, it has 75-mm wheels that make it suitable and easy for carving. Included is also automotive-grade lithium-ion batteries, mobile connectivity, and several sensors. You can get a 100% satisfaction with the overall build of the Fitnessclub Hiboy Electric Skateboard. It comes with a solid and strong construction considering the eight layers maple wood deck it offers. This gives a flexible and sturdy ride and also supports a maximum weight of 220lbs. The product feature dual hub motor that provides 700-watt of power that can help you reach the maximum speed of 22mph. A travel range of 9 to 13 miles and a 36v lithium-ion battery with 4000mah capacity that fully charge within two hours are included to ensure the product performs even in the toughest of terrains. A rechargeable wireless remote is also added to its features to make speed switching, braking, and movement easy. The BLITZART Huracane GT electric skateboard comes with powerful dual motors of 700 watts power that offers the 21 miles maximum range and speed of up to 23mph. Just like most of the best electric skateboard, the product features a wireless remote and a lithium battery pack that requires about 3 hours to charge. Additionally, the deck of the skateboard features 8 layers that are forged with 2 layers of bamboo (top and bottom) and 6 layers of ply maple wood in between it. The deck supports a maximum weight up to 250lb and has a grip tape that helps to keep your feet firmly in place on the board. When compared to some other best electric skateboard, the battery takes a longer time to fully charge. If you are looking for the best high-end electric skateboard, this Evolve Skateboard might be the perfect option for you. 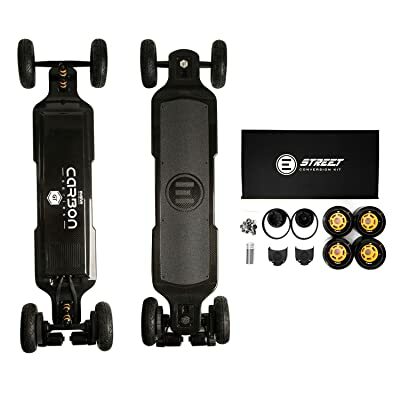 It comes with a deck that is forged from high-grade molded carbon fiber and Kevlar which provide an excellent flex for a smooth ride. The product comes with high-performance motors that offer 3000 watts of power that can reach the top speed of 26mph. Additionally, the skateboard has a range of up to 31 miles when the battery is fully charged. 83mm and 7-inch wheels are included to tackle any terrain you through at it. Also, the product features 25 percent hill climb grade which makes hill climbing hassle-free. 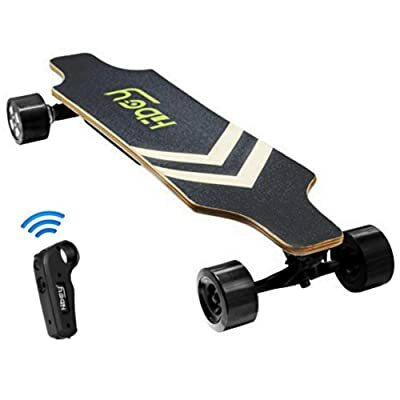 The skateboard has a digital LCD screen remote that indicates speed, controls the trip function, gear settings, 4-speed settings and also display battery. The best electric skateboard is more than just appearance or beauty. It should be powerful, fast, reliable, safe, and ready to tackle any terrain you bring on its way. If you go for any of the products reviewed above you can get the most of your money. Going for the perfect electric skateboard for you gives you the opportunity to welcome yourself to a world of adventure, excitement, and fun. No doubt, all the products reviewed some of the best you can find on the market. However, Evolve Carbon GT Series Electric Skateboard steals the show. Even though it might be expensive, the skateboard is worth the money with its excellent performance and strong construction. From its power, speed, and range to its deck and wheel, it is a top-notch skateboard. We know choice varies from one person to another, which is why we have made available our buyers guide to help you make the right and perfect decision. Remember, to always consider the factors mentioned when purchasing an electric skateboard and you won’t make a mistake in your pick.